By some estimates, more than 100 million Americans appear to have digestive issues that can impact their ability to properly digest their food. The inability to completely digest foods can lead to uncomfortable digestive symptoms such as bloating, gas, abdominal pain and problems with elimination. For some, this can be a sign of a serious underlying medical condition including Crohn’s disease, celiac disease or exocrine pancreatic insufficiency (EPI). For many others, low-grade inflammation, infections, allergies, dysbiosis, food intolerances, poor diet or simply aging may lead to improper digestion of food and poor absorption of nutrients. A properly working digestive system allows for food to be broken down into small, usable molecules and for the complete absorption of the nutrients without causing intestinal discomfort. Enzymes are not only essential but are required for all biochemical and metabolic processes and play a critical role in everyday health and maintenance. They turn the food we eat into energy, support the immune system and hormone production, and enable the ability to utilize vitamins and minerals. In order to utilize nutrients from foods, several organs release specific enzymes that individually break down carbohydrates, proteins and fats as well as vitamins, minerals and other compounds into small absorbable particles. Amylase and other sugar-specific enzymes break down large starch or carbohydrate molecules into a two-sugar molecule known as maltose. Other digestive enzymes are released in the small intestine to further break down maltose into simple sugars, which are then absorbed by the cells. Lipase is manufactured by the pancreas and, when combined with bile produced by the liver, breaks down dietary fats, or triglycerides, into fatty acids and monoglyceride molecules that then can pass through the small intestine and into the blood stream. 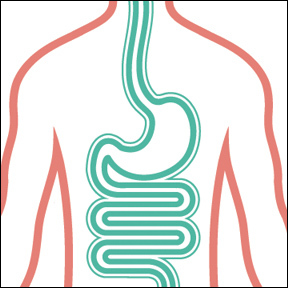 Protease, peptidase and other protein digestive enzymes break down large protein molecules into a pool of single amino acids, which are then absorbed by the small intestine. Lactase is essential to the complete digestion of milk and dairy products. Lactase breaks down lactose, a simple milk sugar. When an insufficient amount of lactase is present, lactose intolerance or the inability to digest milk sugar can result. Intestinal health is critical to the health of your immune system and your optimal health. A properly working digestive tract is essential to energy production, proper bodily functions, and overall wellness. Insufficient digestion can lead to a very wide range of health concerns including autoimmune disease, arthritis, chronic fatigue, fibromyalgia and migraine headaches. Lifestyle changes, dietary modification and enzyme supplementation can often help to lessen the uncomfortable and sometimes embarrassing symptoms associated with impaired digestion. Although we produce enzymes in our bodies, we must continually replenish enzymes through proper nutrition and good eating habits. Consume more raw foods, especially organically grown raw foods, as they naturally contain the necessary enzymes needed to digest and absorb the nutrients contained in the food. Processing and cooking destroy natural food enzymes. Food enzyme deficiency places unnecessary stress on the pancreas and other enzyme releasing organs to produce the additional enzymes needed for proper digestion. To reduce inflammation in the digestive tract, add more cleansing and alkalizing vegetables and eat a small amount of fruits. Celery, cucumber, avocado, arugula, melon, pineapple, and blueberries are helpful choices. Avoid pro-inflammatory foods such as gluten, sugar, alcohol and processed foods. Foods processed with additives, preservatives or nitrates are often lacking the enzymes needed for proper digestion. Consume more anti-inflammatory foods including essential fatty acids found in cold water fish and eat leafy greens, high fiber whole fruits and vegetables, and fermented foods, which support a healthy gut microflora. The proper chewing of food, along with the enzymes and lubricants contained in saliva, initiates the digestive process, allows for food to enter the stomach in a pre-digestive state, and relieves some of the stress on an overburdened digestive system. Unfortunately, many of us do not properly chew our food. When we rush through our meals, foods entering the stomach can be sadly lacking in pre-digestive enzymes. Regular supplementation with digestive enzymes can take the stress off the pancreas and the entire body. Powerful digestive enzymes support normal body organ functioning while preserving the natural production of digestive enzymes. Taking a digestive enzyme supplement with meals reduces the amount of energy we spend digesting our foods and helps to maximize our enzyme producing potential. Below is a sampling of enzyme supplements for digestive support. Choose the one that’s right for you and say goodbye to common digestive inefficiency and hello to healthy digestion and increased nutrient absorption. Digest Gold™ Plus Probiotics by Enzymedica provides award winning, high potency digestive enzymes along with guaranteed delivery of specially coated TherActive™ probiotic cultures for maximum performance. Formulated to assist in the digestion of proteins, fats, carbohydrates and fiber, these digestive enzymes plus probiotics supply a complete formula for optimal digestive health. Similase® (Tyler) by Integrative Therapeutics provides comprehensive support for digestion and absorption of all food groups including protein, carbohydrate, fat, fiber and phytate. This physician developed formula contains pure plant enzymes, including amylase, protease, lipase, lactase, phytase, cellulase, sucrase and maltase, that are active in both acidic and alkaline gastrointestinal environments. Digestzyme-V by Ortho Molecular contains a full spectrum of 20 vegetarian digestive enzymes to provide comprehensive digestive support in a broad range of pH levels. This unique formula also includes artichoke and gentian root, which stimulate bile production and support the body’s natural enzyme production. Digestive Enzymes Ultra by Pure Encapsulations contains a high-strength blend of vegetarian enzymes that support enhanced digestion of proteins, carbohydrates, fats, dairy, and fiber that promote optimal nutrient absorption and bioavailability. This entry was posted in Home and tagged Digest Gold™ Plus Probiotics by Enzymedica, Digestive Enzymes, Digestive Enzymes Ultra by Pure Encapsulations, Digestzyme-V by Ortho Molecular, Similase® (Tyler) by Integrative Therapeutics. Bookmark the permalink.